Former quarterback Dan Marino left a legacy with the NFL. He's suing over concussions. The President flies to Europe with the baggage of Bergdahl's release in tow. A study says sexism makes hurricanes deadlier. 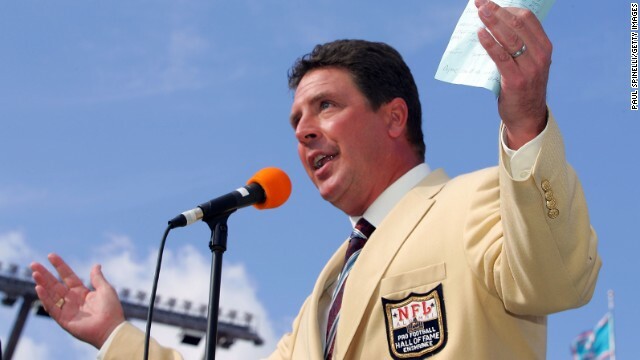 And former NFL star Dan Marino sues the league over concussions. Bergdahl unchecked baggage? The slapping hand of criticism can reach across an ocean. It follows President Obama, as he lands in Poland today to soothe allies' jitters over the Russian bear that's ambling around Ukraine's border. Republicans have unleashed a new line of attack against Obama's foreign policy judgment. His decision to exchange five Taliban prisoners who were held at Gitmo for Bowe Bergdahl's safe return has them pushing up their sleeves. A chorus of veterans behind them accuse Bergdahl, who is recovering in Germany, of desertion. Assault on innocents: Children were the victims in two stabbings over the weekend. A tall man in Brooklyn, New York, stabbed a 6-year-old boy and a 7-year-old girl in an elevator in their apartment building, police say. They were on their way to buy ice cream. The boy died; the girl was critically wounded. In Wisconsin, two 12-year-old girls allegedly lured a third girl, a friend, who is also 12, into the woods near Milwaukee, where they stabbed her 19 times. They were trying to impress an Internet meme known as "Slenderman," police say. The girl was found alive on a sidewalk begging for help. She is in stable condition. Take the female names seriously: Apparently, sexism isn't just a social problem - if you're in the path of a hurricane, gender bias might actually kill you. Researchers concluded that people underprepare for hurricanes with female names. That results - on average - in significantly more deaths. Critics say the study is skewed, because early on, for decades, storms received only female names, and conditions were much more dangerous back then. The lower average death rates in more recent times, when storms have received names of either gender, is due to better all-round preparedness and safety, they say. And what if the hurricane is a cross-dressing man? Counting concussions: When you're an NFL player as long as Dan Marino was, you take more than your share of thrashes, spills and helmet spears. On his way to several league records, he packed away 17 years worth. Now, the former Miami Dolphins QB is suing the NFL, saying it knew concussions could cause long-term damage. Marino wants monetary damages and medical monitoring for former players. CNN is seeking NFL comment. More buzz than boom: Police in San Francisco arrested a man Monday on suspicion of explosives possession, and social media is buzzing. It appears that Ryan Chamberlain may have been very active online - professionally as a social media marketer. One squeaky clean post after the next. Police are checking to see if a sad note titled "Goodbye" could be from him. Some messages aimed back at Chamberlain contain words of encouragement from netizens who think what they see is a nice guy down on his luck. Be sure to tune in to "New Day" from 6 to 9 a.m. ET. Join us at NewDayCNN.com, and go and have a GREAT NEW DAY! I also liked the videos. And there isn't an entry at all today! This is the first thing I look at when I get up in the morning! CNN weather forecaster stated the current Omaha storm puts 35 million at risk – a true alarmist. Please note Nebraska population is around 1.85 million; Iowa's is around 3.0 million. . I'm disappointed when there are no videos, as well! I use this to get my day started with the top 5 news stories (which are often depressing), then like to watch a few of the videos to make me smile. Helps balance things out. Thanks for letting us know you enjoy the extra videos. We'll share your comments with the NewDay web team and see what they can do about adding those back. In the meantime, get your fill of some fun each day by visiting CNN.com/videos and scrolling through the "Collections" list. You'll see everything from inspiring videos to fun and shocking, as well as great idea and goofy pieces, too. Check it out and let us know what you think. Why did you stop putting the random video clips on the 5 a day? I always enjoyed those! I'm missing the videos at the end. Will you be doing them again?